Choosing a ringtone volume can be hard – there is no one setting that is right for all environments. What works perfectly at home may be too quiet for when you’re on the train, but too loud for the office. 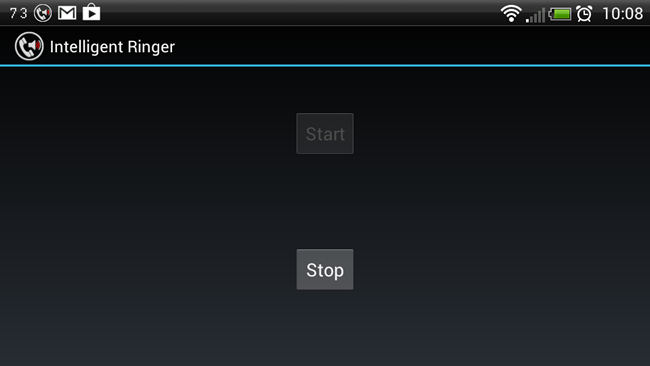 Intelligent Ringer can be used to adjust ringtone volume according to ambient noise levels. When your phone rings you need to be able to hear it. Enabling vibration is helpful for when your phone is in your pocket, but this does not help you to hear your phone in noisy environments if you just have it on your desk. 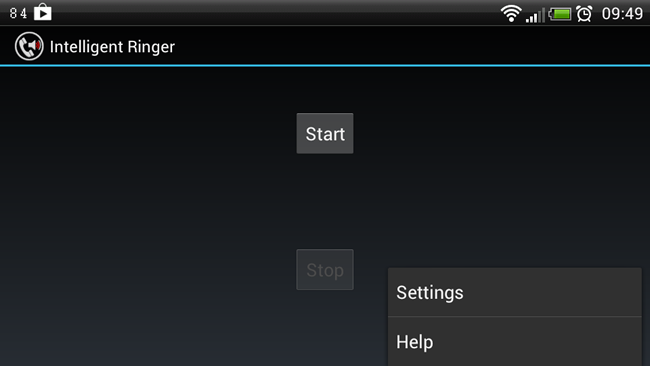 Download a copy of the app from Google Play, fire it up, hit the menu button and head to the Settings. All settings are controlled through a series of sliders, and each of them is fairly self-explanatory. 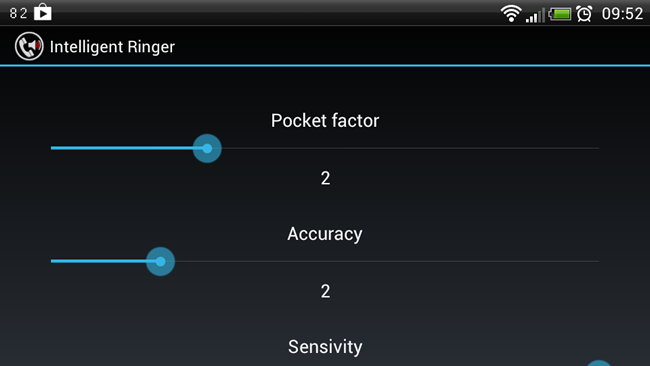 The Pocket Factor slider only comes into play when you have ‘Pocket mode’ enabled. This uses your phone’s proximity detector to determine when it is in your pocket and boost the volume according to how you set this slider. Scrolling down you can configure the maximum and minimum ring volumes – use the Minimum setting to configure how loud the ringer should be in quiet situations, and Maximum for noisy places. To avoid having to manually start the app every time you want to make use of its features, check the ‘Start on boot’ option. 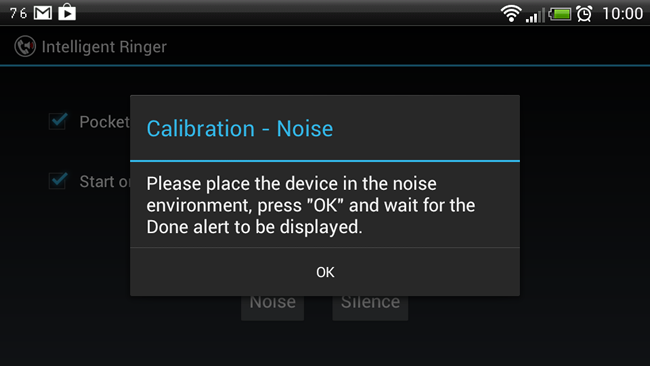 To help improve the accuracy of the app when it comes to interpreting volume levels, make use of the calibration options at the bottom of the screen. When you are in what you would consider to be a noisy environment – when you would want the ring volume to be high – sample audio levels by tapping the Noise button. Similarly, when you are somewhere quiet, or silent, tap the Silence button to sample audio levels in such an environment. In each case, tap OK and then hit Done when sampling is complete. Until you next restart your phone and have the app start automatically at boot, tap the back button and then hit Start to get it up and running – a notification icon is displayed so you’ll know Intelligent Ringer is active. You might be concerned that constantly monitoring background noise levels would have a negative impact on battery life, but this is not the case. In fact, Intelligent Ringer only checks ambient noise levels when a call is received, effectively introducing a very slight delay before ringing at a volume that is appropriate to the current conditions. Should you find that audio level measurement takes too long, try lowering the Accuracy slider slightly.